Nestled among the tiny shops, streets and stall vendors in the Seomun Market is Seomun Cooking Academy, where locals and foreigners can learn basic cooking techniques for authentic Korean dishes and other foods. The academy works in unison with local market vendors to raise the market’s public profile and encourage more shoppers to visit. 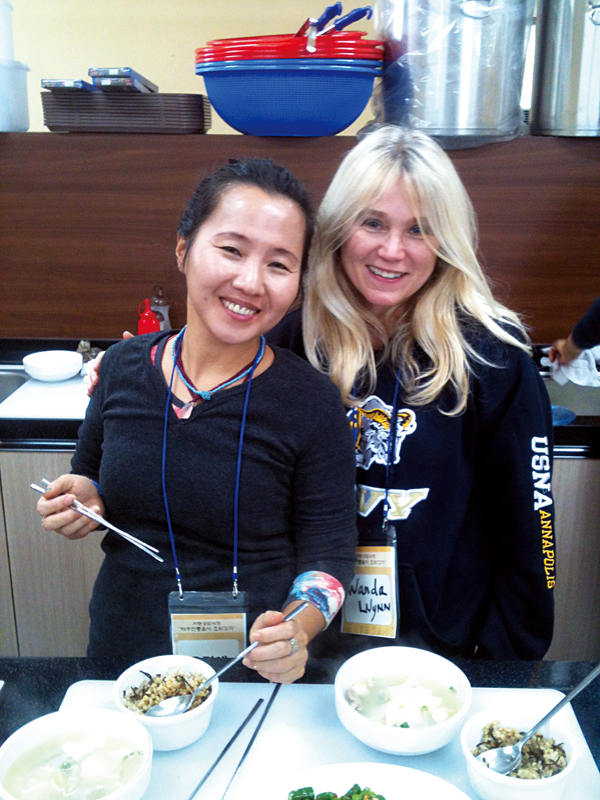 The classes are provided by Chef Yang Yong-Jin, the academy owner and traditional food researcher, and Kim Yang-He, a chef who researches fermented foods such as yogurt and kimchi. A Korean friend of mine first invited me to attend the academy and consid-ering how much I love to cook and eat, I was thrilled by the invitation. After checking into class we walked around the market with Chef Yang and purchased ingredients for three dishes to be prepared from various merchants. On this particular day, the market was not crowded and it was an easy, laid back stroll. We visited several small shops and purchased pork ribs, different vegetables, tofu, and some anchovy stock that had been aged for a year. Anchovy stock is a common ingredient in many Korean soups as well as other foods. With ingredients in hand, the class moved back to the school kitchen and watched Chef Yang as he demon-strated how to cut, chop, and cook the various dishes. We were in groups and after the demonstration began to prepare the dishes for ourselves. It was especially nice to touch every-thing with our own hands as we prepared each dish from scratch with fresh and raw ingredients. First, we washed the pork ribs and cut them into smaller pieces before cooking the meat in a pot on medium heat with four cups of water. While the ribs simmered, we sliced the radish and tofu into bite-size pieces. Next, we chopped the green onions, garlic cloves and fresh ginger and then prepared a thin mixture with the buckwheat flour and a quarter cup of water. After the meat simmered for 20 minutes, we added the sliced radish, two tablespoons of anchovy stock, soy sauce, garlic, ginger and buckwheat flour mixture. This was simmered for 10 minutes before the salt, green onions, and tofu were added and simmered for 10 more minutes. This was one of the most delicious soups I think I’ve ever eaten. Really! It was about three to four servings per recipe. However, do not add too much water to the pot when boiling the ribs as it will take much longer to cook. The Seomun Cooking Academy and Seomun Market are a great way to spend a few hours on a Sunday afternoon and embrace the taste sensation that is traditional Korean food. Chef Yang makes it easy to follow regardless of the language barrier and it was an awesome experience. I recommend it to all food lovers!